Click here to view the Framed Selection. The great Bison herds of the American West were decimated with the arrival of the railroads in the early 1800's. The photograph was created as a remembrance of those terrible days. When I was shooting the Bison on the fog shrouded hillside in Yellowstone, I could see the mystical outlines of the sagebrush in the background. As I watched the young bull exhale, the steam from his nostrils made it look like the steam from a locomotive. When I got back home I picked out a photograph of the steam locomotive housed in Cheyenne and started the process of adding it to the picture. As I worked everything just fell into place and so many things just meshed in theme as well as subject. Look carefully at the image and see what you notice. The image was selected for the 2006 Chamber of Commerce Art Award and will be used for many of its functions and publications. It is hanging in the Cheyenne Depot Museum complex. 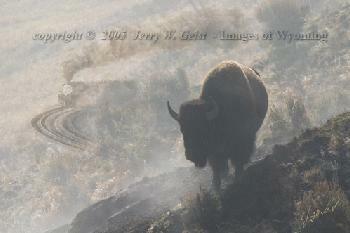 It also won a third place award in the Old West Museum's juried Quicksilver Photo Competition for 2005. It is being offered here as a completed 20 X 30 canvas print mounted using the Bainbridge Art Care mounting system and framed in a special contemporary/rustic frame for only $750 plus shipping.